On the grounds surrounding the museum in Russell on February 10th I found various cultivated native plants, along with little signs that identified some of them. The one shown above is Apium prostratum subsp. prostratum var. filiforme (yikes! ), known in Māori as tutae koau and in English as shore celery and New Zealand celery. 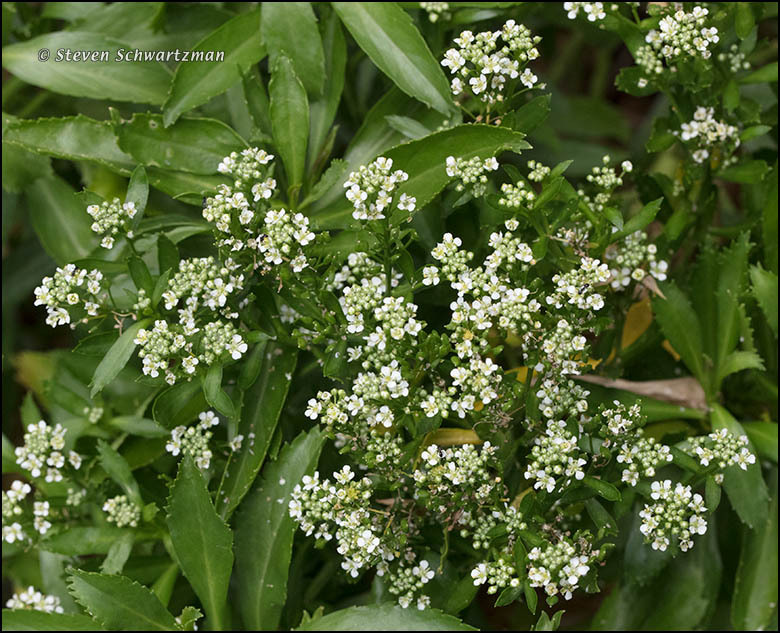 The one shown below is Lepidium oleraceum, called nau in Māori and Cooks [sic] scurvy grass in English. British sailors ate both of them to ward off scurvy, as the last link and another explain in more detail; in fact those plants were the first two ever gathered for food by Europeans in New Zealand. I missed my chance to sniff or nibble those two New Zealand plants. In Texas we have a member of the family called prairie parsley, and I did munch a leaf once to see how it tastes. Not very good, I’m afraid. Now it’s your turn to try some Danish scurvy grass and report back to us. Here in Illinois we have several look-alike plants, some of them deadly. We also have a couple of the deadly look-alikes from Europe in Austin. 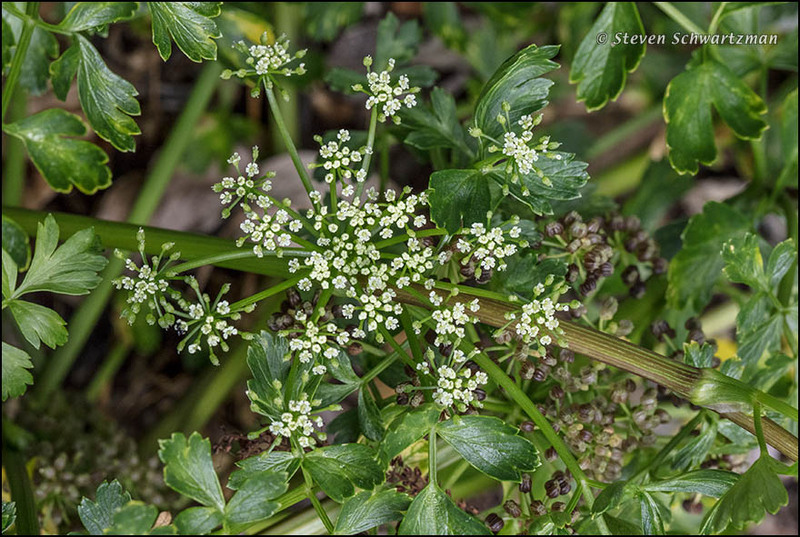 the blossoms remind me of water hemlock, but yes, it definitely looks like celery! Hemlock is also in the family—much to our peril. The scientific name of that family is Apiaceae, the main part of which should remind you of Spanish apio. oh yes.. today i used the words, apio, cebolla and pimiento and told my friends those three are called the holy trinity by many in louisiana! I didn’t know that. I assume that the Cajuns originally referred to them as céléri, oignon, and poivron. si.. you’re right.. but i was talking to spanish-speaking friends — about how to make a roux, and then gumbo… perdon, i should have been more precise!!! I took one look at the leaves of the shore celery and thought, “Those resemble prairie parsley leaves.” I discovered that both plants are in the same family, the Apiaceae, and then saw your confirming comment. (Make that “comments” — I just saw your mention of the family name.) The prairie parsley is running amok just now, and I’ve been watching the development of the leaves, to see if they keep the shape of the initial leaves I saw on the burned prairie, and they certainly do. I’d rather ward off scurvy with citrus, but these plants would do if oranges and lemons weren’t around. I haven’t heard of any native citrus in New Zealand, so I expect the early British sailors were only too happy to find these vitamin-C-supplying plants from the celery family, whatever they might have tasted like. I’m glad to hear the prairie parsley in Texas is having a good season. The flower clusters and resulting seeds should give you plenty of chances for pictures.